Refer a Friend, Colleague or Family Member to Insignia Futures & Options. Insignia Futures & Options prides itself on offering excellent customer service to all of our clients. We know that the biggest compliment that we can receive is when one of our clients refers a friend, colleague or family member to us. To show our deep appreciation for any clients referred to Insignia Futures & Options, both our current clients, and the new clients they refer, will each receive a $50 account credit as a thank you for putting your trust and faith in our services. Current Insignia Futures & Options clients: Simply complete the referral form below. 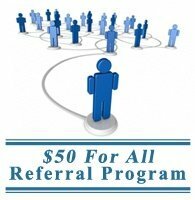 We’ll then contact the person you’ve referred on your behalf with our referral program details. If the referred person opens a futures trading account with Insignia Futures & Options, both you and the person you referred will each receive a $50 account credit as per the terms of this offer*. This credit will be the same as cash and can be used for trading purposes or withdrawn. For both parties to earn the $50 (“Account Credit”), the individual(s) you refer must open an eligible futures trading account, make a qualifying net deposit of at least $3,000 and execute at least one (1) trade within 30 days of the initial opening deposit. This offer is valid for new clients who do not currently have or had an Insignia Futures & Options trading account is the last 90 days. The Account Credits will be credited to both the referring account holder and referred account within approximately one week of your qualifying referring party’s net minimum deposit and first executed trade. The account(s) referred by you must maintain their trading account at Insignia Futures & Options for at least three (3) months or both the referring and referred accounts may be subject to a charge back for the value of the Account Credit. Please note that Insignia Futures & Options reserves the right to change the offer terms or terminate the offer at any time without notice. The Account Credit, when combined with the value received from all other offers in the last 12 months, may not exceed $500 per account holder. This offer is not transferable, salable, or valid in conjunction with certain other offers and is void where prohibited by law. Other restrictions may apply. Consult with your tax advisor about the appropriate tax treatment of the Account Credit before participating in this offer. Any related taxes are your responsibility.